Vanlalsiam is currently 11 years old. His parents and two siblings have all died (we assume due to HIV/AIDS) and so he is cared for by his grandmother. He has been attending MSF's Singngat clinic here in Manipur since 2008, having started antiretroviral and antituberculosis treatment with the Ministry of Health but not getting any better. MSF changed his treatment slightly, but he still didn't improve. He deteriorated and was admitted to Shalom, a community care centre in Churachandpur that MSF supports with drugs, materials and staff. The first photo was taken in November 2009 in Shalom, and I honestly thought he would not survive. He was very unwell with chronic diarrhea, poor appetite and severe pulmonary tuberculosis (he had an appalling chest x-ray.) It was hard for MSF to decide whether it was multi-drug resistant TB or whether it was resistant HIV. He was so weak that it was difficult to get a sputum sample to test for multi-drug resistant TB, but when his HIV viral load came back as extremely high we hedged our bets and went with HIV resistance. This meant changing his regime to an unusual 2nd line regime (that needed extra tablets to overcome the interaction with other medication he was on for tuberculosis). 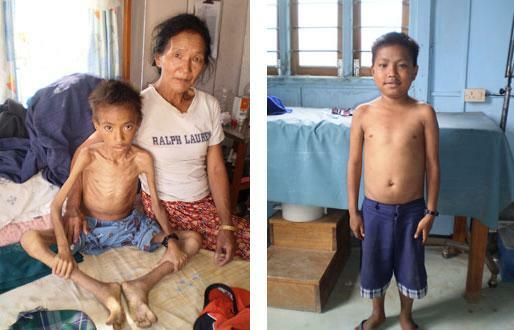 The second photo was taken at a follow-up appointment at MSF's town clinic in Churachandpur in April 2010 and I could barely believe it was the same child. His grandmother is so grateful, and clearly spoils him rotten (he was eating a big bag of crisps!). She now walks him several kilometres to school each day and waits there until after class to walk him home again. When I last saw him, he was happily playing with his classmates like an average healthy 11 year old boy. In the north-eastern state of Manipur, MSF runs four clinics providing basic healthcare, HIV and TB treatment and counselling as well as maternity services. In 2009, MSF provided over 31,000 basic health care consultations. Pregnant women living with HIV were provided with anti-retroviral therapy for their own health and to prevent transmission of HIV from mother to child. MSF is treating over 400 HIV patients with anti-retroviral drugs.